‘To You, Moscow’ is a long and slow Soviet propaganda film celebrating Moscow’s 800th birthday by depicting its turbulent history. During the film we watch Moscow’s settlement, the victory of Ivan III over the Tartars (15th century), the revolt against Polish occupation (17th century), the defeat of Napoleon’s army in 1812, the 1905 revolution, the 1917 socialist revolution (‘led by Lenin and Stalin’) and the 1941 defeat of the fascist army to the present day. 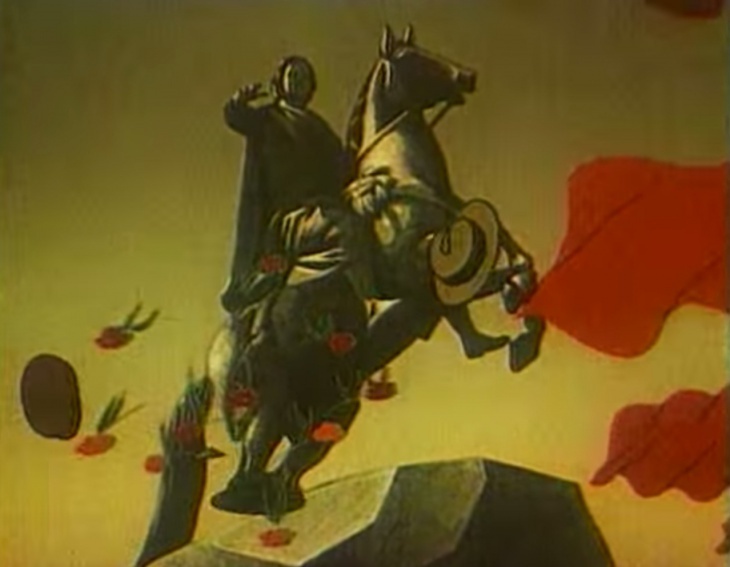 The socialist revolution section leads to live-action footage of Moscow, a happy child, flowers, some buildings and street scenes and statues of Lenin and Stalin. The last section, the celebration, shows photographs of heroic inhabitants of the Soviet Union, and not only glorifies Moscow as “our youth, our glory”, “our dear mother” and “our birthday girl”, but also as a “glory to Stalin”. The different sections are bridged by letters and postcards to comrade Stalin. The sections themselves focus on strives and battles, and are accompanied by alternately realistic and symbolic images. For example, the 1917 revolution is depicted by the czarist double-headed eagle struggling and falling to pieces, while the most impressive part may be that of 1812, with its realistic images of fire. It may be clear that this film is propaganda at its worst. The film is saved from becoming totally unwatchable by the beautiful animation, the stark images, and the lively patriotic music. 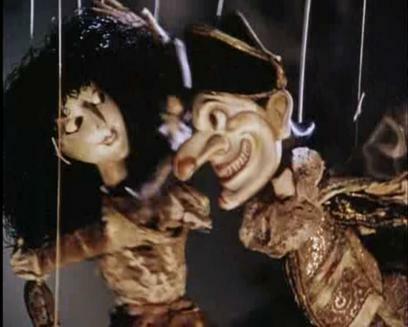 Based on plays by Federico García Lorca, Cabaret (a better translation would be ‘farce’) is a puppet animation film, using puppets in a puppet theater. The film is something of a musical and tells about the love between Donna Rosita and Don Cristobál. The music, by world famous composer Sofia Gubaidulina is odd and rather unconvincing in its avant-garde version of the musical genre. The film falls into two parts: the first part looks most like an ordinary puppet play: it’s fast, hectic, humorous, and even vulgar, with a strong sense of eroticism. Halfway the film, however, the mood changes drastically. Don Cristobál gets rid of his strings and tears off his grotesque mask to reveal a more noble face. With that the film enters the second part, a dreamlike, lyrical one. Unfortunately, the narrative gets lost in this part, and in the end the film suffers from its length, from its meandering music and beautiful, but vague imagery. ‘Cabaret’ was Gagarina’s Fourth film, and her third after she had joined Soyuzmultfilm in 1976. In 1988 Gagarina and Gubaidulina would work together again on “The Cat That Walked by Itself”, a feature film based on Rudyard Kipling’s ‘Just So Stories’. Unfortunately she came to a tragic end, as she was murdered in her own house in 2010. 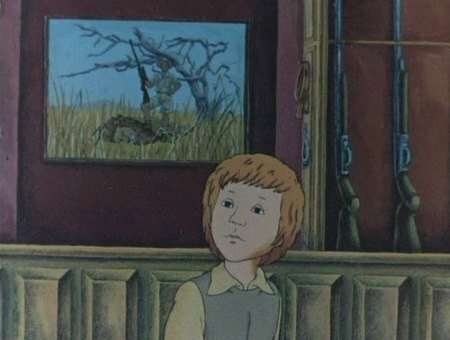 This Soviet animation film starts when a boy enters a hunting shop. When he looks at a photo of a hunter on top of a dead lion, his imagination starts to wander. He imagines himself in a forest, and on a Savannah, full of wildlife. When encountering the lion, he prevents the hunter from shooting. Unfortunately, he’s awoken by the shop owner. ‘Hunt’ is a silent film, told with realistic images, strong 1970s designs, and dated electronic music. The film’s opening is probably its best: we’re watching images of busy and indifferent city life, before zooming in on the boy. The film clearly celebrates life, especially in the Savannah scenes, which form a rich contrast to the dull city life images. Nevertheless, the film feels traditional and naive, and more as a product of its time than as a timeless classic. ‘Pereval’ (The Pass) is a science fiction film from the Soviet Union about three youngsters, descendants of some astronauts stranded on a strange, alien planet, who make a quest to the original spaceship. The film is dark and moody and the atmosphere contemplative, even in the action scenes. Nevertheless, there is a weak comic relief in the form of an eight-eyed, elephant-like creature, which the youngsters encounter on their way to the ship. 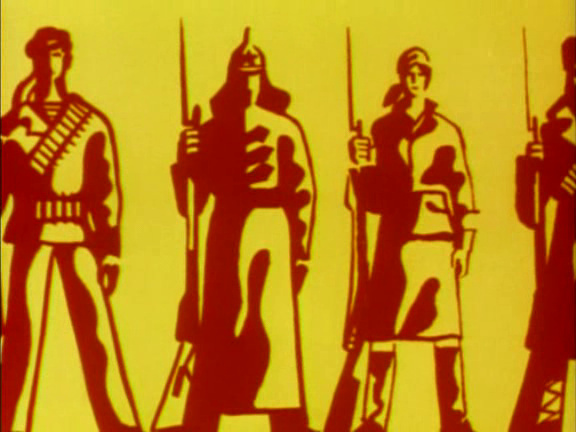 In this film Tarasov uses a bold, realistic style with sharp contrasts: he juxtaposes stark shadows with monochrome yellows and reds to create a unique graphic atmosphere, reminiscent of the work by Frank Miller. The planet is portrayed as barren, disturbing and threatening. The images are often very surreal, and no attemption is made to give the backgrounds any sense of realism. This makes this film comparable to Laloux’s ‘La Planète sauvage‘, despite its difference in style. The spaceship, for example, looks more like an alien temple, and one gets the idea that the journey of the three is more symbolical than real. The mood is enhanced by a Dio-like hard rock song. 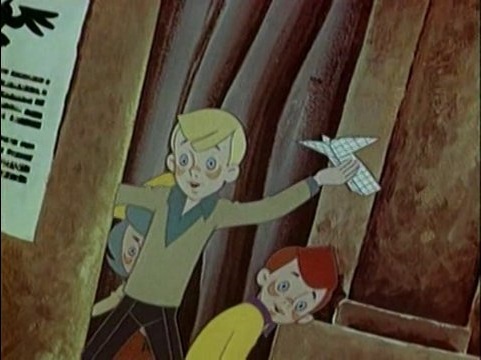 ‘Pereval’ was the last animation film Tarasov made during the Soviet era. See the modest Wikipedia article to learn what happened to him after the fall of the Soviet Union. ‘Contact’ is a good-humored short film in which a pipe-smoking, nature-loving hippie encounters a multicolored alien, capable of morphing. First the man flees in horror, but then the two make contact through music, and in the end we can see them walking into the distance, singing together. This Soviet film is surprisingly Western-looking and is drawn in a bold seventies style. In contrast with Tarasov’s earlier ‘Forward March, Time!‘ any Soviet association is lacking, and there seems to be some vague message about freedom. Tarasov shows his directing skills and is not afraid to use bold angles and extreme perspectives. 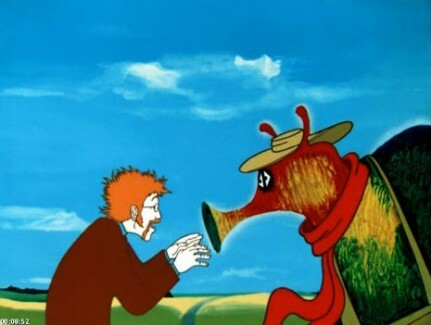 The short contains a typical cartoon chase, accompanied by lively jazz music. 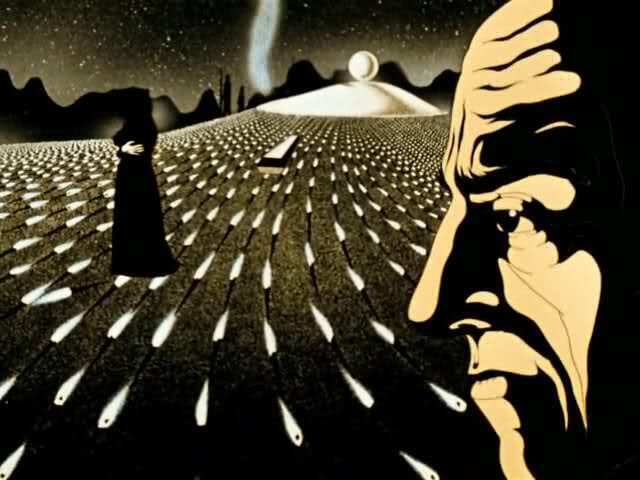 In 1979 Tarasov returned with the graphical equally original, but much more propagandistic film ‘Shooting Range’, proving that he was one of the most interesting Russian animators of his generation. ‘Forward March Time!’ is a bold setting of a poem by soviet futurist poet Vladimir Mayakovsky (1892-1930). The film illustrates the meandering poem with associative images of the 1905 revolution, the 1917 revolution, World War II and even a futuristic battle in space. 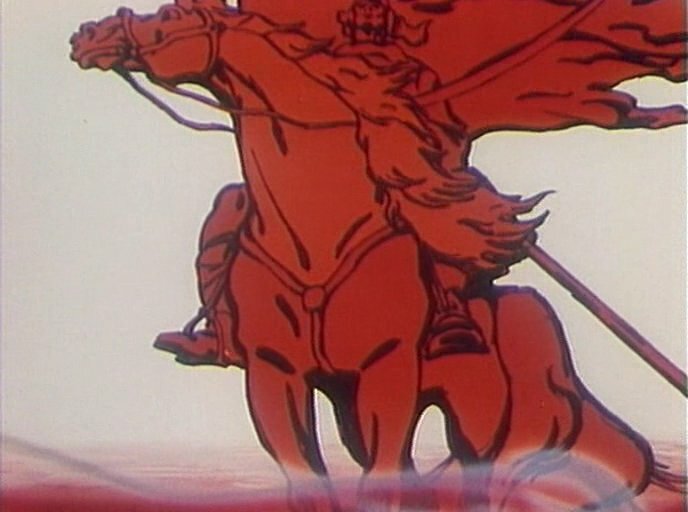 Using a combination of typical seventies designs (besides communist paintings) and rock music (besides an excerpt from Mahler’s fifth symphony), the film is both a markedly modern and interesting piece of soviet propaganda, if a bit too long. 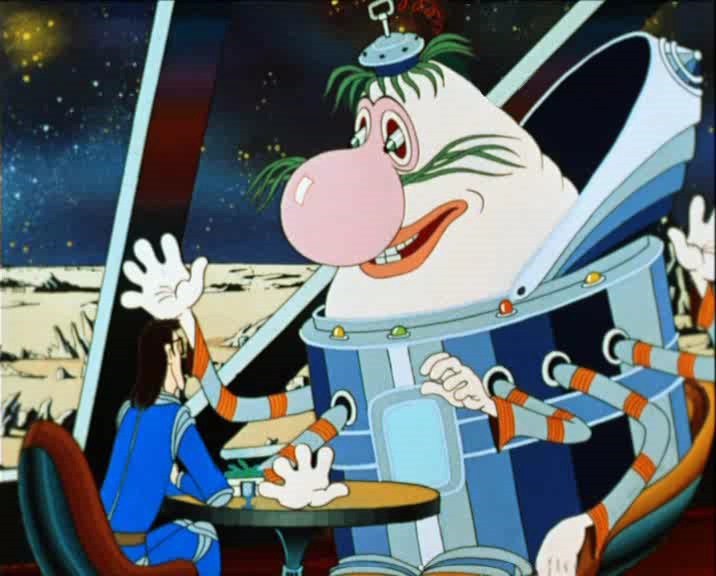 It shows Tarasov’s unique style, which he explored further in the much more lighthearted short ‘Contact‘. 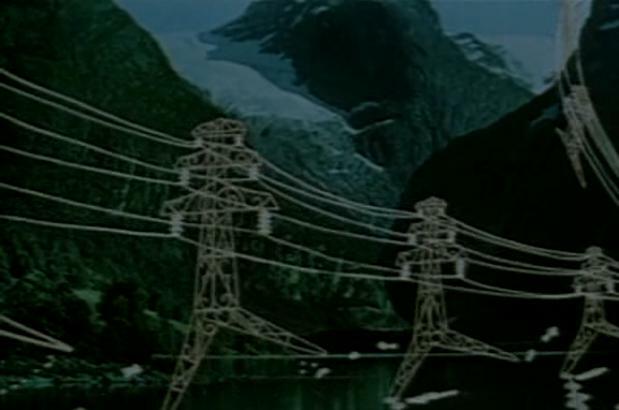 ‘Plus Electrification’ is a commissioned film for the State Commission for the Electrification.The film propagates the electrification of the Soviet Union. Accompanied by a folky song glorifying electricity, we watch electricity pylons march through the countryside and Soviet electricity pylons shaking hands with Czech and Polish electricity pylons. Its use of old-fashioned communist imagery, black-and white live action footage and ridiculously heroic music makes the film extremely dated. Despite the colorful images and even a look into the future, one can hardly comprehend that this film was made in the 1970s, not the 1940s. ‘A Hot Stone’ is a Soviet propaganda film from the 1960s based on a children’s book by Arkady Gaidar from 1941. In it a boy stumbles on an old stone in the woods, which has the ability to give someone a new life again. The boy wants to help an old and lonely man with it, but the man sees no need for it as he has led a happy life. Enter the propaganda, in which the old man tells about the revolution and the civil war. This part is not much of a story. but it’s full of symbolic images, like people breaking their chains, and a giant worker slashing the double headed eagle of the czarist empire with a giant hammer. ‘A Hot Stone’ is a slow and boring film, but it’s also beautifully designed, in an original graphic style, which makes use of bold ink strokes. Filmed in two colors, ‘Ali Baba and the Forty Thieves’ is a long puppet animation film from the Soviet Union. The short takes half an hour to retell the famous story from One Thousand and One Arabian Nights quite faithfully. 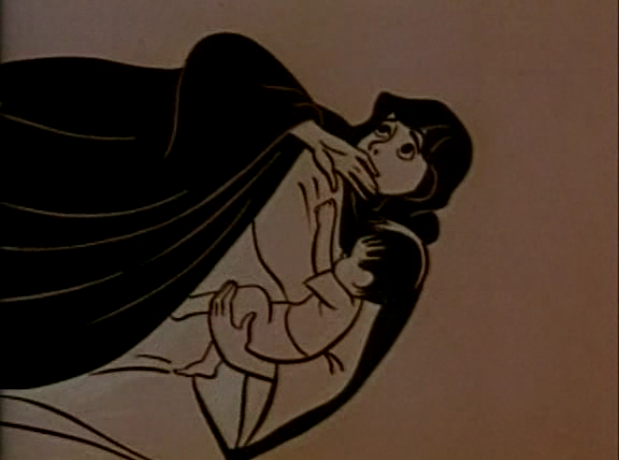 The film features the death of two characters, but the grim ending of the original story is lacking. Instead of being killed, the forty thieves are captured by the townspeople. Interestingly, Ali Baba is not the real hero of the story, but rather his wife, a girl he bought on a slave market, unfortunately run by the very thieves he had robbed earlier. It’s this slave girl who decoys and fools the thieves to their own destruction. 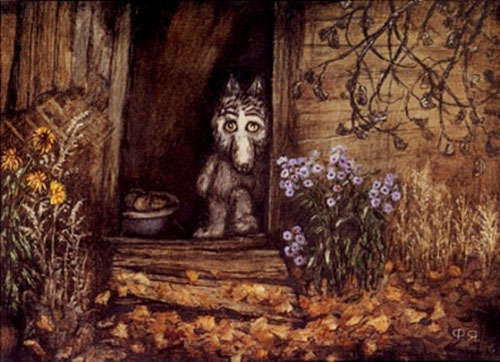 The film uses a narrator who does all the voices, and a very lush score by composer Eduard Kolmanovsky. 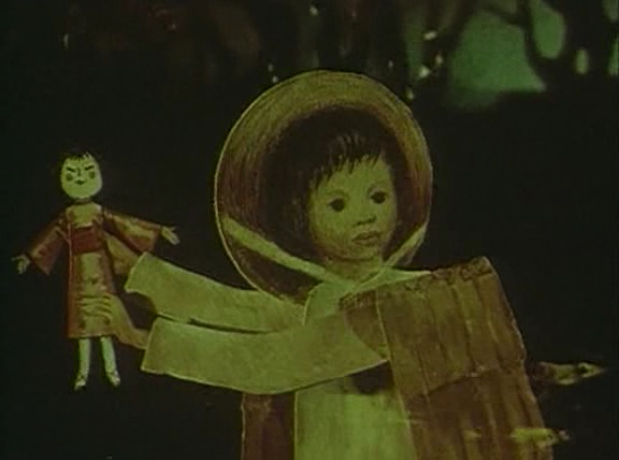 The film is quite slow and the puppet animation isn’t as sophisticated as in contemporary films by Jiří Trnka. The puppets have no facial expression whatsoever, and cannot move anything in their face, except for the gang leader, who can roll his one eye. Only occasionally their emotions become apparent. The best example of this may be the terror of Ali Baba’s neighbor when he realizes he’s trapped inside the thieves’ cave. About the film’s director, Grigori Lomidze, little is known. He also directed the propaganda film ‘To You , Moscow‘ (1947), which combines live action and cel animation. Nothing points to a long experience in stop motion, and unfortunately, it shows. Nevertheless, ‘Ali Baba and the Forty Thieves’ is a charming film, succeeding in evoking the typical atmosphere of the Arabian Nights. ‘The Yellow Stork’ is a Russian fairy tale film set in China. 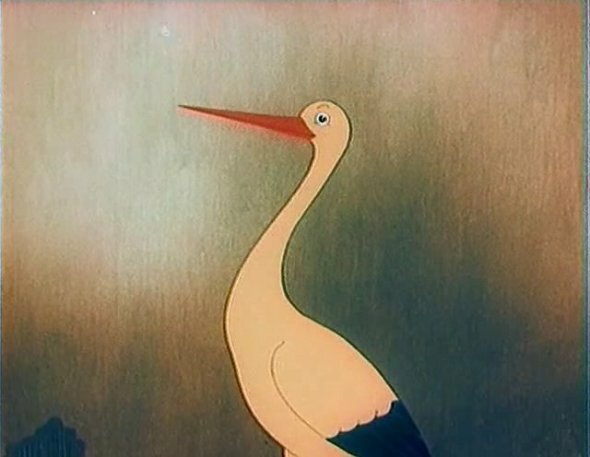 The film tells about a flute player, whose music is so vivid, it can bring a drawing of a stork to life. An evil mandarin captures the bird, demanding it to perform for him. But the stork will only dance to the flute player’s music, and when it hears this music, it flies away through the window. This film, which uses song, seems to celebrate music and freedom and appears to be a pamphlet against oppression, which is remarkable for a film made under Stalin’s rule. The animation in this short is very good, with beautifully animated humans. The result is one of the more enjoyable Soviet films of the era.